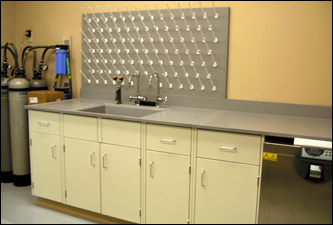 Mott’s painted laboratory casework has a thermosetting laboratory grade powder coating that delivers exceptional chemical and scratch resistance, excellent hardness, adhesion and a quality finish. Several colors are available through Mott’s standard color selection chart, and we also have the capability to custom match colors when required. All colors are quality controlled with micro-processor technology to ensure consistent color. 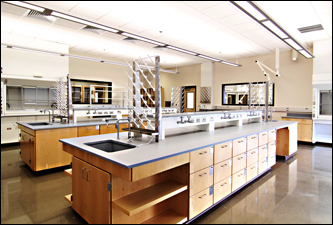 Mott’s stainless steel furniture, fume hoods, canopy hoods and countertops are highly durable, easy to clean, simple to maintain and have an extended product life providing excellent value. Mott’s entire standard product line is available in both 304 and 316 type stainless steel and is manufactured to a #4 satin finish. We also have the capability to provide custom design for specific applications. Our countertops are built to order, following our customers’ specific requirements. Continuing our commitment to the environment, over 50% of new stainless steel comes from re-melted stainless steel scrap. Traditional quality craftsmanship brings a rich and lasting presence to your environment. Sophisticated high-tech machinery, computerized engineering processes, quality materials and skilled craftsmanship combine to assure quality. With Mott, you are investing in cabinetry engineered with structural integrity, durability and aesthetics proven to withstand the rigors of everyday use. All of Mott’s products meet the stringent durability standards of the Scientific Equipment & Furniture Association (SEFA).